ClearLite ArmorLite CFL Bulbs | OhGizmo! I’m all for the pros when it comes to compact fluorescent lighting, but most people don’t realize just how dangerous mercury vapor can be when a bulb breaks. Not the people at ClearLite though. 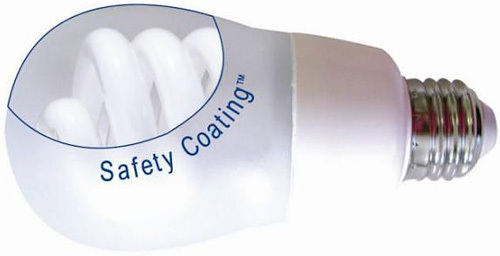 They’ve created a new CFL bulb called the ArmorLite (SRP $7.99) that features a silicone safety shell preventing broken glass and mercury from escaping if the bulb breaks. Unfortunately while it’s a clever solution to the problem, it’s not a perfect one. The silicone shell will require extra steps when it comes to disposal, and it will no doubt have an adverse affect on the lumen rating and color temperature of each bulb. But it’s a step in the right direction. Interesting, it's like a light bulb condom. Soon it will come in different colors and flavors. i think ive seen these in stores, or bulbs identical to them. personally i like regular cfl's. just dont break them. So are you saying that I shouldn't snort mercury vapor? Oh well, back to exhaust fumes. Of course without the lead, what's the use? Too bad they sometimes break on their own. Perhaps someone needs to invest in transparent aluminium version. But this still lets mecury leach into our watertways. Have you ever heard of mecury amalgam? It is a much better solution than this. It is much safer and no need to pay for the skin or the extra mecury needed to make the bulb bright enough behind the skin. This is nothing new. It is a CFL placed inside a housing and then coated. Where is the big deal? ClearLite has no manufacturing facilities and I would like to know what Chinese company they have contracted with to produce the product shown. I think it is an over hyped bunch of marketing. multiple DVD Case,Slim DVD Case,Standard DVD Case 3 way DVD Case,4 way DVD Case,5 Way DVD Case Mnaufacturer from China.